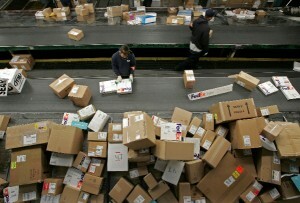 Russia’s Federal Customs Service has suggested tougher regulations on foreign goods purchased by Russians online. Foreign goods are currently cheaper in overseas shops than in Russia. Moreover, Russians do not have to pay taxes or VAT on those purchases unless they exceed €1000. The bill is expected to be introduced in the country’s State Duma early this autumn, which is considered a season of increased business activity. Andrey Belyaninov, head of the Customs Service explained that overseas sellers are more competitive and that translates in losses for Russia’s economy. The announcement is likely to spur anger from Russian consumers who are used to purchasing goods from abroad for at least twice as cheap. Sometimes, however, they resort to overseas purchases due to a lack of particular goods in the Russian market. Russian consumers also experience problems with the delivery of items; the recent collapse at the Russian Post system when 500 tons of parcels were stuck at the airport is yet more proof of the inefficiency of the country’s postal service. At the same time, the Federal Customs Service is not meeting its target of sending money to the country’s budget. For the first five months of 2013 it has transferred 2.6 trillion rubles ($82 billion), that is a 2.3 per cent decline against the same period last year.